Nearly implemented in one evening (Friday evening, before the UI freeze), and a day (well, a long day, it's 4:30 AM). 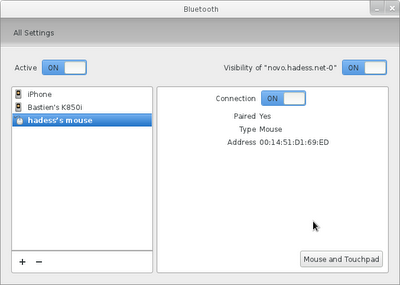 The only thing not implemented is the hardest part, the "active" button, which needs to take into account whether there are Bluetooth devices at all, if one is the default and powered, and handle hardware killswitches as well as software ones (software-based airplane modes for example). As per usual, refer to the design documents for more information on the changes made. Following on from the region panel, we now have an updated “Screen” panel for the control-center. Richard worked on the initial version (which you can see in older revisions of the control-center for GNOME 3), and I finished hooking it up this week. Not much to say about this, except that the lock screen timeout preference now changes the underlying preferences for both “on AC” and “on battery”, as well as the idle time (which is used by a number of desktop components like your IM application). I'm also very glad that we managed to get rid of the brightness levels based on whether on battery or mains power. This usually worked exactly as you didn't want it to. Now, just use your keyboard shortcuts for those instead of hoping to gouge somebody's eyes out every time you changed power source. See also the design page for more information about the changes made.